Cherry shrimp, red cherry shrimp and R.C.S is short for it (Neocaridina davidi) – is without any doubt the most popular shrimp that inhabits in tanks. It’s not picky, easily gets accustomed to any tank parameters and conditions. Besides, this shrimp is peaceful and eats food leftovers in the tank. For most of the aquarists this is the shrimp that becomes the first one bought and stays the favorite one for ages. So, our article is exactly about red cherry shrimp keeping in a tank and breeding. Actually, this shrimp is a color variation of an ordinary freshwater shrimp from Taiwan, bred by means of selection and improving of its rich coloring. However, in the wild these species have rather plain, pattern painting. Which is hardly a surprise, since with bright red coloring they will barely survive in the wild. As for their classification, it is in a mess nowadays. At first their Latin name was – Neocaridina heteropoda and Neocaridina denticulata sinensis, but now they were renamed to Neocaridina davidi. Its wild ancestors inhabit in freshwater habitats in Taiwan and are known for their unusual plainness and breeding rate. These were the first shrimps that appeared in amateurs aquariums, but they gave way to cherry red ones over time. Nowadays shrimp fans have even invented a classification for them (based on the size and color of the shrimp) and elite shrimps sometimes are quite costly. This is a small shrimp which very seldom grows to be (1.5 inches) 4 cm long. Usually they are about 2 cm (0.8 inches) large. Its lifespan is about a year. However, it’s quite difficult to say for sure, since as a rule there are about several dozens of red shrimps in a tank. As for its coloring – its name speaks for itself. The shrimp is cherry red and it looks very good and bright against green background of dark green java moss, for example. It’s quite difficult to discuss some of coloring peculiarities, because these shrimps are small and you really can’t see much. How long is shrimp lifespan? Well, it is not very long – about a year. But usually they breed fast and you’ll have lots of juveniles by the end of older species lifespan. In the wild Neocaridina davidi is very vulnerable and the same they are in a tank. Shrimps are small sized, can not defend themselves, they can only mask. However, cherry shrimps can not even mask. Even small fish can eat them or cut their chela off. Therefore, it is perfect to keep them in a special tank without any fishes. In case if you don’t have such a possibility, you should keep small and peaceful fishes. These can be, for example: harlequin rasbora, neon tetra, oto, white cloud mountain minnow. I used to keep all these fishes with shrimps successfully and I’ve never had any problems. But it was Angelfishes, who killed all the Neocaridina davidi in my tank completely. In a few month there was nothing left from dozens of shrimps! Therefore, I advise you to avoid any Cichlid fishes (even Dwarf ones), especially Angelfishes. The rule is simple here – the larger the fish, the higher chances are that it’s not compatible with cherry shrimps. If there is no choice and you have already put shrimps into the tank, you can at least put some java moss into it – for shrimps it is easier to hide there. This shrimps are completely harmless. If you have seen them eating some dead fish – the fish has died as a result of some natural factors and shrimps are just eating its body. These shrimps are active during the day, you can see them moving around the tank and decorations when looking for some food. Red cherry regularly shed their skin and you can see their empty exoskeletons on the tank bottom or in the water. There is nothing to worry about here, since shedding is a natural process and since the shrimp grows its exoskeleton becomes too small for it. You may just leave it in the tank, shrimps will just eat it. The only thing you should keep in mind is, that when shedding your shrimps will need a place to hide and java moss or other tank plants will be perfect for this purpose. First of all you should know that cherry shrimp is a schooling one. This kind of crustaceans feels fine only in a school of ten or more species. The tank should be 4–8 litres large (0.88–1.76 imp gal; 1.1–2.1 US gal) and you can keep a small shrimps colony there. 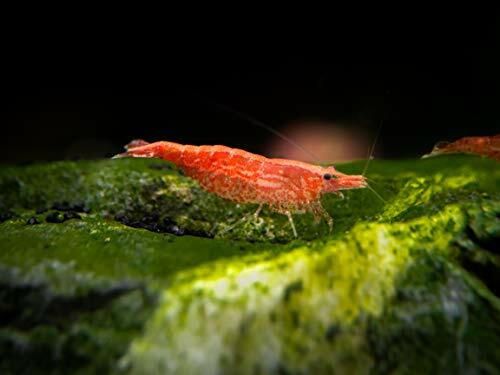 Cherry shrimps are perfect tank inhabitants even for beginners. The main thing you should remember is not to keep them with large fishes. These shrimps excellently adapt to quite different tank conditions and parameters. The water should be neutral or a bit acidic one (рН 6.5-8), water temperature about 20–29 °C with low content of nitrates and ammonia – that is all that required to keep shrimps in a tank. Small number of shrimps can be kept even in nano tank. Still to make your shrimps feel comfortable you need a tank of larger capacity and a lot of tank plants, especially moss. For instance, java moss gives the shrimps shelter and food, since it captures some food particles in it. Cherry shrimps eat zoo- and phytoplankton that forms on moss twigs and at that they don’t harm the moss at all. Also moss shelters the shrimps when they are shedding and their juveniles after their birth. This way a pile of moss turns into a “kinder garden”. So, all in all a bunch of moss in a tank with shrimps is not just very beautiful, but it is also necessary and important there. A colony of shrimp works as a very effective cleaning crew for your tanks, cleaning up algae and waste! Shrimps coloring is another important issue. The darker the tank bottom and plants are, the brighter the shrimps look. If you have a light colored tank bottom, these shrimps look pale. Also how bright is their red coloring depends on the food the shrimps eat. Live and frozen food makes them brighter colored and vice versa eating flakes makes their coloring pale. However, you can feed them with special food for shrimps which brighten their red color. As for the chemicals, the only danger you should be aware of is the presence of copper in the tank water, since it is harmful to all crustaceans. If you are using tap water to fill the tank, you should buy conditioners to clean water from copper, plumbum and other metals. What you should use to feed cherry shrimp? In general they feed on various microalgae. When in a tank these shrimps eat any kind of food, but they prefer food with high content of vegetable substance. You can also feed them with vegetables: slightly boiled squash, cucumbers, small carrots, spinach, nettle and dandelion leaves. The shrimps pick up pieces of live and frozen food from the tank bottom and eagerly eat specialized food for shrimps. If you want your cherry shrimps to be really bright, you should feed them with branded food for shrimps. It is desirable to feed the shrimps once a day. The amount of food should be enough for the shrimps to eat in 2 hours maximum. Overfeeding is very bad for shrimps. It may cause their death as well as affect tank water parameters. Remember that in the wild shrimps collect waste and leftovers from the bottom. They are omnivorous, they eat everything they find 24/7. Male is smaller and less bright if compared to a female shrimp. Tail of the shrimp males is not that wide as the one of the female shrimps, since it’s not meant for carrying eggs. The easiest way to see between male and female is when they are carrying their eggs (the female shrimp holds the eggs under her tail). She moves all the time and moves her legs to ensure that the eggs get enough oxygen. During this period of time red cherry shrimp female becomes especially timid and it hides in the dark. This is a totally simple process. You just have to create proper conditions and put males and females in one tank. Later you can see the female shrimp carrying eggs under her tail, they look like grapes. As for red cherry shrimp mating, it happens as follows. Usually after shedding red cherry shrimp female releases pheromones into the tank water and this way signalizes to the males that she is ready to mate. The male shrimps start looking for the female and then the short mating process occurs. In some cases a young female shrimp may drop the eggs due to its small size or lack of experience. To decrease its stress try not to disturb the shrimp female and keep the tank water clean during this period. As a rule, female carries about 20-30 eggs for 2-3 weeks. The eggs are yellow or greenish and they become darker as they grow. When small shrimps hatch they are tiny (about 1 mm large), but they look exactly as their parents. They hide in the tank plants for several first days (they are almost invisible there) and eat plankton. Juveniles don’t require any special care. The main thing they need is a place to hide. As for the female shrimp, in a few days she can be carrying eggs again.